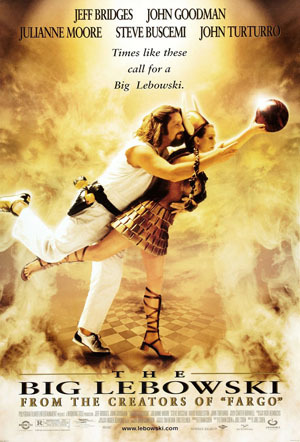 The Big Lebowski (1998) is a film about which feelings run high: viewers tend to love it or hate it. It’s a shaggy-dog tale from Joel and Ethan Coen, who also wrote and produced A Serious Man, also on this list. These essays are not meant to be reviews, instead a rabbi’s commentary on the Jewish content of a film. The Big Lebowski has significant Jewish content: it is the only film I can remember which explores the Jewish identity of a Jew by Choice in any depth. “But you aren’t Jewish anymore!” says the Dude, exasperated. Walter is insulted by that suggestion, explaining that just because he and his ex-wife split up, he’s still a Jew, and he’ll be a Jew forever. Walter is passionate about much in life, and he is passionately Jewish. That may seem like a relatively small slice of Jewish content, but consider how few images there are of adult converts to Judaism in film. The only other film I can think of at this writing that even mentions conversion is the dreadful Keeping the Faith (2000), which suggests it as a clever way to paper over differences. If my readers have any questions about the suitability of this film for children, that clip should have taken care of it. It’s vulgar, profane, tacky, and obscene in bits. It’s also very funny. 1. The Big Lebowski has a cult following, with an assortment of drinking games. Here’s a game to play with a glass of Kedem Concord Grape Juice or the kosher wine of your choice: Raise a L’chaim every time Walter mentions his Jewishness or defends its legitimacy. 2. Notice one of Walter’s Jewish habits: he quotes sources by name to illustrate his points, not only about Judaism but about nearly everything. See if you can count the number of times he cites a source. This is what’s known as speaking b’shem ro, in the name of someone. It’s very good form to cite your sources by name, a form of respect, and a way to avoid stealing credit for someone else’s words. 3. What Jewish values does Walter live out in the course of this film? What Jewish values could he perhaps work on in the future? 4. What stereotypes about Jews by Choice can you identify, not just in the film, but in your experience? Which of those stereotypes does Walter fit? Which does he not fit? Are any of the stereotypes contradictory? This entry was posted in United States and tagged Comedy, Conversion, Interfaith, Jewish Identity, Shabbat. Bookmark the permalink.